Sure to be enjoyed by many. evel-5 first caught my attention ten years ago with the release of its first full-scale title for the PS2, Dark Cloud. Since then the developers have become one of Japan's premier RPG developers and have also expanded their product diversity with the Professor Layton series for DS. Their most recent RPG, White Knight Chronicles, brought me back to my younger years when my love for Japanese RPGs was strong. 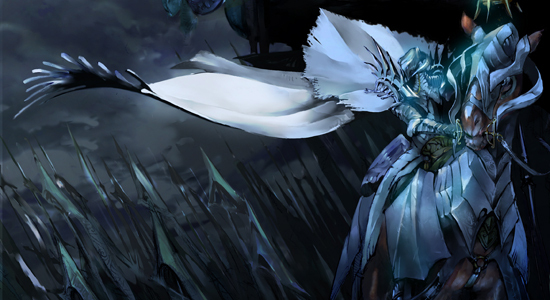 White Knight Chronicles is a cinematic experience that doesn't rely too heavily on cutscenes. The story plays out much like an anime series. It starts off in the city of Balandor, where a party is being held for the princess' coming-of-age. During the banquet, an organization known as Magi invade. A boy named Leonard tries to help the princess escape through the castle cellar where he and the princess come across an ancient set of armor that was uncovered seventeen years prior, called the White Knight. Leonard harnesses the power of the White Knight to try to protect the princess, but the princess is kidnapped by the black-armor-clad Dregias, general of the Magi. It's a predictable story, but thoroughly enjoyable nonetheless. Play the knight, save the princess: predictable, but thoroughly enjoyable nonetheless.While Leonard is the main character of the game, a player creates an avatar that is a silent partner to the cast. The main purpose of your avatar is for the online portion of the game, but you have the option to switch between playable characters at any time while traveling. Areas of the game are marked on the world map by dots, which can be traveled between instantly once they are unlocked. Battlefields are reminiscent of Final Fantasy XII, as is the battle system. You walk around the map in a group of three, battling enemies freely that are within range. Other party members that may be available can be switched out while not engaged. You gain levels through experience points like any standard RPG, but you also earn skill points with each level to buy skills in any of eight skill trees. Battle skills and magic learned can be placed in combat slots, three rows of seven, that are accessible while fighting. The game features a unique combo system where you can develop and name your own combo moves with skills you've learned. The one gripe I have with combat is that, try as you might, there is no way other than the invisible die-rolls to dodge enemy attacks. Although you have to be close enough to use your skills on an enemy, it seems like they can attack you from any distance. Improvise: develop and name your own combo moves with skills you've learned.During the main quest you'll get sub-quests on areas you've already visited and can buy optional quests. These are designed for finding materials to craft items, earn extra money, and are used for online play. Online play is somewhat limited by the fact that you can only do short, isolated, timed quests with up to four players. You log into the games online servers called GeoNet and set up a homepage. You can visit others' pages and also post on the in-game discussion boards. When you complete quests online you earn points toward your guild rank. When your guild rank levels up you unlock higher-level quests and craft items. Another aspect of online play is the Georama, a virtual town you can set up with shops that others logged onto GeoNet can visit and quest from. The sound design and graphics of the game are quite pleasing. The music is nice and the voice acting is actually pretty good. The graphics are often stunning, especially the skies and distant objects. The pre-rendered cutscenes are some of the best-looking I've seen in a game this generation. Despite having a few flaws, White Knight Chronicles is still a fun game both off and online. Multiplayer quests and a new game+ option give this title plenty of replayability. PlayStation 3 is finally starting to gain some ground with Japanese RPGs, and with a sequel already planned, this game is sure to be enjoyed by many. Wasn't that big a fan of the ending. It was probably the biggest middle finger I've seen given to players since the end of Legacy of Kain: Soul Reaver.Otherwise it's just as Joseph said, fairly predictable throughout. The online is making up for it, even if it is turning into a grind-fest.